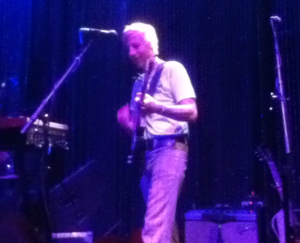 Last night I caught one of my favorite musicians playing one of my favorite venues in Philadelphia. John Vanderslice played a late night set at the bar Johnny Brenda's and I couldn't help but be touched by the kindness of the music and the kindness of the performers. I should preface this article/review with the fact that I almost didn't get to see this show. As such, I was in great spirits from the moment I walked in the door. I've been trying to see Vanderslice perform live for the past five years but there was always something in the way. Last night seemed to be another case of missed opportunity. I already had a ticket for a live taping of Doug Benson's Doug Loves Movies podcast and I hate to throw a good ticket away. So I went to the taping (which was hilarious, but that's a different story for a different post) and was walking past the bar John Vanderslice was playing at around 10:10pm. I decided to pop in and just catch the last song or two, and there in all its glory was a sheet saying "John Vanderslice: 10:15pm." Now I don't want to paint some unrealistic picture of Philadelphia here. It's not a magical city where every night is so jam packed with fun you don't know what to do with yourself. Last night was a fun-fluke. On to Vanderslice himself. Have you heard his music? I can't recommend him enough! His songs range from small and fluttering to huge and grand, often switching mid-song. I guess you could slide it into that huge slot called "indie." Drum machines kick back beats as he strums an acoustic guitar and synthesizers whirl in the far background. It was, for a long time, the best and only political indie music worth listening to. And it is, always, kind. Even though his music deals with death, misplaced children, obliteration and 9/11 it still comes off excedingly kind. His music is often gentle. It deals with these heavy issues like a feather bobbing on a breeze, full of compassion, never direct in its course. If you want to know about the history of his recording output or personal info, you know there's a site for that (that probably, as usual, misses the mark). Let's talk concert! Vanderslice played alongside Jason Slota. Vanderslice mainly played acoustic and electric guitar with an imposing squad of pedals underfoot. Slota played drums and kept the baseline on a moog at the same time! Jason Slota's timing and prowess on his instruments were impeccible. It's amazing that two men pushing the buttons of four came off sounding better than a quintet! Vanderslice wrote on his website that April and May were both audience participation month. He offered examples like "You can sing lead or harmony vocal on 'Trance Manual'" and "You can trigger that cool squiggly sound in 'Underneath The Leaves.'" This, truly, is where the kindness of the musicians shone through. For the above mentioned song Trance Manual a fan wrote in that he transcribed cello music for the song. So, when it was time to play the fan sang lead vocals on the song as another fan played a cello. It was amazing and endearing. You could tell a dream was coming true right there on stage. And Vanderslice, always the gentleman, really did stand back and let this fan sing lead vocals. Another fan sang back up vocals on a beautiful song called I'll Never Live Up to You and yes, an old friend of John's did indeed trigger the cool squiggly sound in Underneath the Leaves. These were all beautiful moments on stage and the general atmosphere of the concert was one of calm pleasure. John was smiling the whole time. I was struck by that. So many musicians seem to grind away at their instruments, or seem, at best, to be in a struggle with the stage. John Vanderslice was having a blast and we were too! And finally, for the last three songs, he with an acoustic guitar, Slota with a drum from his kit, and opener Damien Jurado with an acoustic guitar all came off the stage and made us circle close around. Seeing them play in an intimate venue was nice enough, but being able to sing along to my favorite songs while Vanderslice himself smiled and sang and heard me, well, that's something I'll never shake. If he comes near your town, you should see him. You could see him on the principle that it's a non-traditional concert experience. You could see him on the principle that it's rare to see a touring musician who seems to genuinely love touring. Or you could just soak up his technical and musical prowess. Also during the concert he invited anyone in the San Fran area to visit him in his studio when they get off of tour. My grand summer adventures will have me in the area in mid-August, so look for a post about it in a few months. What other musician is so kind?